The unclear future of Cambodia’s national railway, following Toll Royal Railways’ suspension of operations on March 31, has cast doubt not only on the oft-delayed redevelopment project but also on a larger build-out expected to connect much of Asia. A TOLL ROYAL EMPLOYEE STOPS TRAFFIC AT A RAILWAY CROSSING IN PHNOM PENH’S TUOL KORK DISTRICT IN 2010. Toll Royal, a joint venture by Australian logistics firm Toll Group and Cambodian conglomerate Royal Group of Companies, had halted operations after continued setbacks in the redevelopment prevented the company generating sufficient revenues, sources familiar with the matter told the Post in March. But the stoppage also will affect the completion of the so-called Singapore-Kunming, China line, which has been under discussion for nearly 20 years and in which Cambodia is expected to be one of three key links. “Obviously, this has implications well beyond the borders of Cambodia. It’s a major setback,” Pierre Chartier, a transportation expert at the United Nations Economic and Social Commission for Asia, said from Bangkok yesterday. Slower progress on Cambodia’s rail lines could mean a slowdown for regional connectivity in general. If rehabilitation and operational efforts decelerate on the Cambodian side, efforts to restore connecting tracks in Thailand and Vietnam could also lose momentum, Chartier said. The Cambodian rail model was a unique one, not only in the region but also in the world, Chartier said. While most governments look internally for rail operators, Toll’s concession was a bellwether for privatisation in the industry, he said. Domestically, delayed rail progress would mean more traffic on the roads, more pollution and more vehicle accidents, Chartier noted. But more than six weeks after Toll Group notified Cambodian officials of its imminent suspension of rail operations in the Kingdom, neither the government nor the company has issued a statement formally announcing the freeze. The Cambodian government has placed the burden on Toll Group to make clear its intentions and future in the Kingdom. “I don’t think there will be an official comment from the government because Toll did not make an official comment,” Council of Ministers spokesman Ek Tha said yesterday. Toll Group spokesman Andrew Ethell said in Melbourne yesterday the company had yet to release an official statement on its Cambodian operations and did not offer a time frame for a potential announcement. Rehabilitation of the railway was “well behind schedule” and did not comply with Toll’s business plans, Paul Power, a consultant at the Ministry of Public Works and Transport(MPWT) said in March. Other inside sources had said that frequent delays in the project had frustrated Toll. The suspension on operations, which reportedly will last a year, has perplexed the government. Cambodia’s integral role in the Singapore-Kunming rail line made Toll’s 30-year concession a keystone for rail lines that were hoped to link all of peninsular Southeast Asia. “I can’t understand why they would pull out. Cambodia is the centre of this rail network,” Ek Tha said. According to a report prepared for the World Bank in July last year, the lack of rail transport could also stymie rice exports. “Indeed, several of the leading exporters express the view that exports could stall at 250,000 tons before rail improvements and port improvements are in place two-plus years hence,” the report states. Transporting Cambodian rice costs US$15 per 100 kilometres, three times higher than in Thailand, Sok Muniroth, an agro-business adviser at Agricultural Development International, said yesterday. 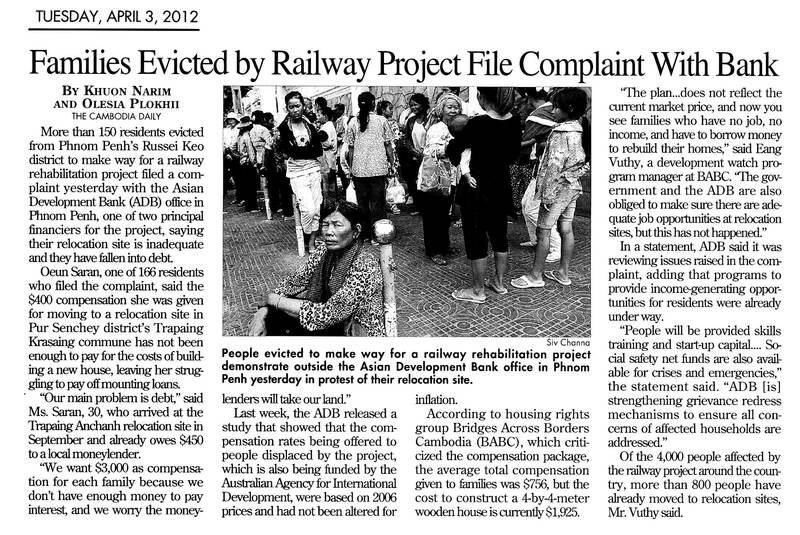 Toll Royal sent letters to officials at the MPWT and Asian Development Bank on March 16, the Post reported at the time. The company halted operations on Cambodia’s only functional line – a stretch between Phnom Penh and Touk Meas, near Kampot – on March 31. Half of the company’s Cambodian staff were reportedly laid off the same day, although Toll has so far been mum on the exact number of domestic workers that were let go. Families that were displaced by a major railway project are facing uncertain futures, after an Australian company announced it was suspending operations on the multimillion-dollar project. The Toll Group will suspend operations in April, according to media reports and the Asian Development Bank, which is funding the rehabilitation with the Australian government. Across Borders, told VOA Khmer. The ADB said in a statement it is working to ensure better living conditions for the displaced. “We share concerns raised by NGOs about the indebtedness of some families following their move and are committed to ensuring that families who have had to move end up at least as well off, if not better off, than they were before their move,” it said. The Australian logistics firm, which in partnership with Royal Group of Companies holds a 30-year lease to operate the Kingdom’s national railway, reportedly told the government of its plan last Friday, Paul Power, a consultant to the Ministry of Public Works and Transportation (MPWT), told the Post yesterday. “The major reason is the rehabilitation [of the railway] is well behind schedule. And Toll believes, rightly or wrongly, the schedule of rehabilitation doesn’t meet with their business objectives,” he said by phone, adding that discussions between Toll and the Cambodian government had been ongoing since last summer. Power presently works as project coordinator for MPWT, upgrading the ministry’s Railway Department. The department is tasked with, among other duties, the implementation of the concession agreement between the government and Toll Royal Railway, the Toll Group-Royal Group joint venture.“Suspension of service and employees takes effect March 31,” Power said in a follow-up email yesterday. Sixty Cambodians out of a total staff of 120 will be laid off on a re-call basis, he said, “with only one expat out of four remaining as far as I know”.